The Sony Xperia E3 is built upon the familiar combination of a Snapdragon 400 chipset and 1GB of RAM. The processor inside is a quad-core Cortex-A7 that's clocked at 1.2GHz and there's an Adreno 305 handling the graphics. We did notice some issues here and there but nothing major. Loading of apps was snappy overall. On the other hand when we had many apps opened up the Xperia E3 would be left with some 140MB of RAM available, although we didn't notice too many slowdowns. Before we dive into the synthetic tests - the Sony Xperia E3 didn't cheat on any of the test and showed identical scores in our anti-cheat tests. As always we'll start off with the CPU-focused and overall benchmarks we have on tap. GeekBench 3 and AnTuTu 5 both place the Sony Xperia E3 in the middle of the table. The Motorola Moto G trio of devices (first-gen, LTE and second-gen) were slightly faster than the Xperia E3. In AnTuTu 5 the Xperia E3 got a slightly better result. 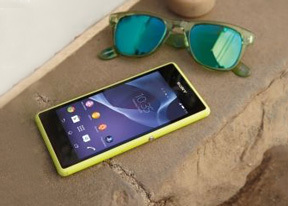 The Xperia E3 even managed to post similar performance to the Xperia M2 Aqua. Basemark OS II shows an overall score and breaks down performance by many factors. We choose to show the overall score and the single and multi-core one. Again we see average performance from the Xperia E3 and it only ever achieved higher results in the multi-core test. The Adreno 305 GPU inside the Xperia E3 managed pretty poor 1080p offscreen results in GFXBench's 2.7 T-Rex and 3.0 Manhattan tests, but it will actually never have to deal with such high resolutions. The onscreen results were okay and in line with its competition and even better on a few occassions. Gaming benchmark Basemark X gives the Sony Xperia E3 a low score - half that of the Motorola Moto G. However, it needs to put less than half the pixels so actual gaming performance is bound to be on par. The Snapdragon 400 is showing its age but is still a good option for a smartphone in the midrange and particularly when it only needs to deal with an FWVGA screen. It handles tasks okay and conserves enough battery for it to not be an issue. You won't be able to enjoy FullHD gaming or superb CPU or browsing performance but you won't be left waiting forever either.